AUGUSTA, Ga. — Augusta National is not a golf course, it's a personality test. It reveals weakness and cowardice, highlights boldness and clear thinking. It asks some of the hardest questions in golf, and the relentlessness of the examination can push players to the breaking point, emotionally and spiritually. After pre-tournament favorite Phil Mickelson staggered in with a second-round 79, he addressed reporters with glassy eyes and a thick voice. His wife, Amy, diagnosed his condition in the language of a concerned therapist: "I think he's kind of in shock." Reed is a complicated character, a lone wolf who plays many of his practice rounds by himself and is estranged from his parents. But justified or not, no one in golf possesses more self-belief than the majorless five-time winner, and on Friday he imposed his will upon Augusta National, which above all else demands the courage of your convictions. Marc Leishman sits alone in second at seven under after a 67. The unflappable Australian has one of the broadest perspectives in golf thanks to a harrowing family crisis: In March 2015 his wife Audrey, suffering from toxic shock in her organs, was put in a medically-induced coma and given a 1-in-20 chance of surviving. But she rose from her hospital bed, and ever since her hubby has been one of golf's most consistent performers. Chasing Reed and Leishman is a collection of blue-chip talent: Henrik Stenson (five under, with a Friday 70), Rory McIlroy (four under, 71), Jordan Speith (four under, 74), Dustin Johnson (three under, 68), Justin Thomas (three under, 67) and six others — Rickie Fowler, Justin Rose and Bubba Watson among them — at two under. The day began with the possibility of a Spieth coronation. The golden child had seized control of the tournament with a five-birdie jag late on Thursday evening, stirring memories of 2015, when he was also in the late-early wave and went so deep under par the tournament was all but over by lunchtime on Friday. But this time around Spieth made a mess of the first two holes, playing them in three-over par to tumble from the lead the throw the tournament wide open. At one point around noon eight players were tied for the lead and three dozen were within four shots. With a storm expected on Saturday, the green jackets had let the putting greens dry out to the point that Mike Weir said, "You get above the hole and you're breathing on the putt to get it down to the hole." Swirling, unpredictable winds ratcheted up the tension. Mickelson called the conditions "a little bit severe." Ian Poulter labeled the course "tricky." Pat Perez offered a two-word scouting report: "F---ing hard." Spieth made another bogey at 7 but the ensuing comeback – he played the final 11 holes in two under - offered some insight into how one of golf's grittiest grinders survived a brutal afternoon. "I've taken a lot of punches on this golf course," Spieth said. "[Caddie Michael Greller] was really good at saying, ‘Man, you always take punches out here and come back stronger.'" McIlroy, playing one group ahead of Spieth, took the clubhouse lead and for a while it looked like four under would be the magic number. Rory remains one of the game's most overwhelming talents, and as good as his distance control and short putting was on Friday, he credited his fine play to the metaphysical. "I'm happy with how I've felt and how I've handled certain things and how my thought process has been," he said. "I feel relaxed. I feel good. You know, I'm constantly having a conversation with myself about staying in the present and just one shot at a time and all the cliché stuff that you hear about. But it's true." McIlroy and Spieth are the two keynote players of the post-Tiger era, and both desperately need a Masters victory to make themselves whole; Rory would become only the sixth player to complete the career Grand Slam while Jordan could finally exorcise the ghosts of his epic Sunday collapse in 2016. But they will have to go through Leishman and Reed, who were in some of Friday's last tee times and enjoyed more benign conditions as the wind slackened later in the afternoon. Both turbo-charged their rounds by birdieing the first three holes and then fought through the instinct to play prevent defense: Reed, with typically virtuoso wedge play, piled up six more birdies, while Leishman threw in another bird and an eagle on the 15th hole after stuffing his second shot to six feet. Reed has always been an explosive presence on the golf course; his mother Jeannette says that as a junior player he was "like a volcano waiting to erupt." He got kicked out of Georgia and very nearly his hometown college, Augusta State. Ever since he's felt like an outsider in his own sport, and that sense of grievance fuels his hyper-aggressive play. Leishman, 34, couldn't be a more different bloke. Over the first two rounds he was paired with Tiger Woods, and in that cauldron his saunter was as leisurely as always, his easy smile omnipresent. 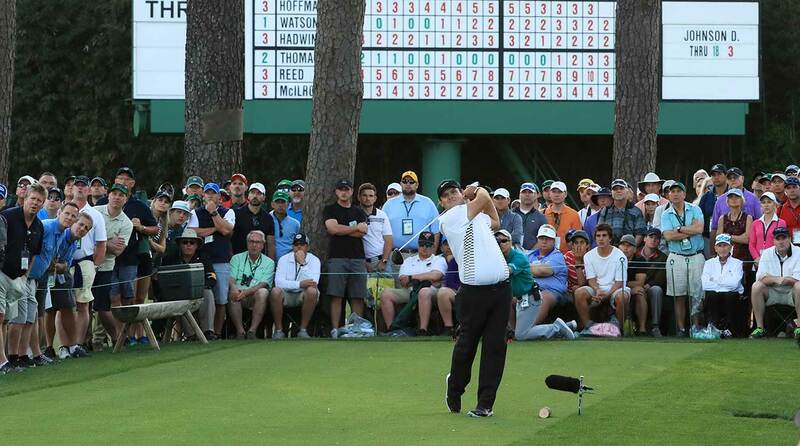 Leishman is one of golf's preeminent feel players and he pulled off the shot of the tournament so far on the 15th hole, slinging a five-iron from 210 yards out around a tree and across the sloping green. What was his thought process? "I thought it was a good time to give it a go," Leishman said with a grin. "Doing that stuff is fun for me." As to how he can possibly survive the stress-fest of being in the final pairing on Saturday at the Masters, Leishman said, "I've obviously been through a lot off the course, and I feel like that helps me on the course. At the end of the day, it's a game of golf, and that's how I try and look at it, just as a game of golf. If I'm having fun out there, enjoying it, I feel like that's how I'm going to play my best. And if I'm stressing about what might happen or what might not happen, I mean, I feel like that's not going to help me. So I just try and enjoy myself." In other words, he passed the test.